Sideboards are the perfect storage solution for the dining room. Originally the top surface would have been used to lay food out on. 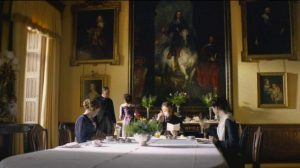 Remember the family scene in Downton Abbey when they would come down for breakfast; the foods would be laid out on the credenza, buffet table or sideboard. The butler would stand stage left, hovering, and the family would pick and choose what they wanted to eat and then go to the table to sit, eat, chat and read the paper? The dinner service is commonly stored in this cabinet. Not in great Houses like Downton Abbey; it would never fit. They needed a room below stairs to accommodate the sort of size of dinner services they used. But for families today eating in the dining room, the sideboard is still used to house crockery and cutlery and the accoutrements to the dining experience. 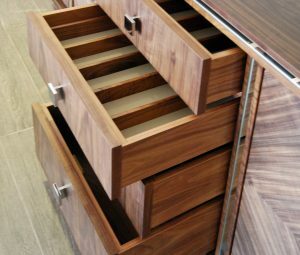 If memory serves correctly the sideboard above was made for a Jewish family who kept a kosher kitchen and required separate cutlery and crockery. Most kosher households have at least two sets of dishes, one for meat and one for dairy. Over the years we have made a whole variety of cabinets we have called sideboards but they have housed all sorts of household possessions and been put in every room of the house. With open plan living items of furniture are used for all sorts of different purposes. Sideboards first appeared in the 1770s in Britain, popularised by Robert Adam. George Hepplewhite, the famous English cabinet-maker, illustrated a sideboard in his Cabinet Maker and Upholsterer’s Guide. And Thomas Chippendale was another noteworthy designer of the time. Georgian sideboards were elegant and slender, with delicate inlay and veneers, usually arranged on twin pedestals. Victorian sideboards were chunky, sturdy and substantial, often made of oak or mahogany. The heyday of the sideboard was the Victorian era, when the industrial revolution led to an explosion of the middle classes – people affluent enough to afford a separate room dedicated to dining. The sideboard was a must-have piece of furniture, on which were displayed cut glass lustres, silver candlesticks or polished brass oil lamps plus decanters, perhaps a silver salver, decorative soup tureen or punch bowl. The earliest versions of the sideboard familiar to us today, made their appearance in the 18th century, but they gained most of their popularity during the 19th century. Sideboards were made in a range of decorative styles and were frequently ornamented with costly veneers and inlays. 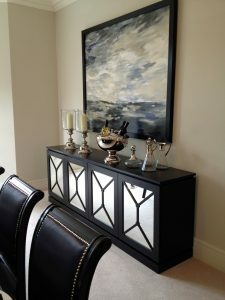 In later years, sideboards have been placed in living rooms or other areas of the home; where household items might be displayed, from fruit bowls to objet d’art or the flat screen TV and record player. We have made more sideboards than I can count, in every size, mix of materials and colour. Once I have created the ‘bespoke’ section on the website i will show you some of them.